RTPnet, previously known as Triangle Free-Net and so named for the Research Triangle Park area between Raleigh, Durham and Chapel Hill, is a volunteer-driven, 501(c)3 nonprofit community network dedicated to helping North Carolina nonprofit organizations leverage Internet tools to promote and support their missions. RTPnet offers annual fee-based memberships to North Carolina nonprofits and CTCs in the southeast. Member benefits include web hosting, e-mail list management (using Mailman as its list serve software), and discounts for RTPnet-sponsored training and events, including an annual statewide conference on bridging the digital divide. AmeriCorps*VISTAs have supported RTPnet community technology projects since the CTC VISTA Project was established as a national effort. VISTA projects allow host organizations to develop and expand programs and services with side benefits that strengthen the host organization. The CTC VISTA Project has strengthened RTPnet and our member network through fostering collaborations, providing a foundation for increased financial support, contributing to an increased understanding of digital divide issues, and helping us attract and support additional volunteers. Triangle United Way and RTPnet co-sponsored VISTAs, Damita Chambers and Vahid Nourani in 2004-05. RTPnet recruited them and had financial responsibility; Triangle United Way provided office space and supervision. Damita and Vahid's work expanded and solidified cooperation between local nonprofit technology assistance providers and well as strengthened the nonprofits they worked with directly. Duke University and RTPnet collaborated to establish CLICK, Creating Literacy in Computer Knowledge. A Duke junior, Matt Lipsky, was developing an after-school program to help 6th graders pass the North Carolina computer competency test. Through the CTC VISTA project, RTPnet recruited Douglas Dumont, a Duke graduate, to work full time assisting Matt in developing CLICK. Duke's Information Science + Information Studies provided the funding for the VISTA position, the office space and supervision; RTPnet did the recruiting and provided additional support through developing ties with a similar project at the University of North Carolina at Chapel Hill. We were fortunate to find a second VISTA, Chad Custer, to expand CLICK while continuing it for a second year. Area VISTAs themselves can be a catalyst for regional collaboration. VISTAs working in different organizations get to know each other during preservice orientation and later help forge connections. Ben Pratt (Durham Literacy Center) and Chad Custer (RTPnet) shared an apartment; Luke Reinke (Durham Literacy Center) and Douglas Dumont (RTPnet) shared ideas as they worked in parallel middle school settings to develop after-school computer literacy programs; Martha Moore shared some of the family literacy ideas from the Durham Literacy Center with the students and volunteers at her center; ideas for recycling computers were shared among all the VISTAs in the area. VISTA involvement in the RTPnet annual conferences built on and reinforced regional collaboration. Eugena Harrington with CNS program officer Marsha Colbert. Our first tech support VISTA, Eugena Harrington (2001-02) did such a good job assisting 20 community technology centers in Orange, Durham, and Wake counties and helping schools in the area that RTPnet received a small grant from a local church toward the expenses for another VISTA to continue this work. Two VISTAs, Ella Holden (2002-04) and Kimmora McKinnie (2001-02), were funded jointly by the Riley Hill Community Technology Center and RTPnet; Riley Hill CTC paid the program fees, while RTPnet covered CTCNet conference and other costs. Another VISTA, Shirlene Rogers (2001-03), was funded by a grant from Verizon. In addition, the VISTAs' good work on projects enhances RTPnet's ability to attract members and donations. Adult Basic Computer Ed Handouts here. Martha Moore's project (2001-04) at the Birchwood Learning Center in Durham opened the eyes of many RTPnet associates to the difficulties associated with running a learning center in a low-income neighborhood plagued with drugs, alcohol, and violence. The team of leaders who helped initiate this project and were supposed to coordinate it disappeared, Martha nonetheless, with guidance, made good progress working with adults. She found that she could actually increase attendance in evening classes by charging a small monthly fee, paid in advance, since the participants had then made a commitment and were more likely to attend classes. But it continued to be difficult to get adults to come to the center. And then the police requested that classes be moved from evening to daytime after a shooting near the center. Gradually, Martha's work focused more on special projects and the after-school program developed in partnership with the John Avery Boys and Girls Club. For the last two years, Martha was the only staff person there. More volunteers: As people learn about our VISTA programs, they realize that they can also contribute as volunteers. Increased volunteerism is both a blessing and a challenge. With the help of Shirlene Rogers (2001-03), we created databases of CTCs and of volunteer skills and availability. Our latest effort, Tech LinkUp, has been designed to help connect volunteers, sponsors, and businesses with community organizations, and to help connect community organizations with one another for mutual support. 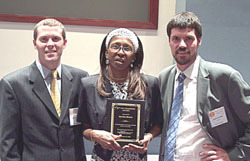 Martha Ann Moore displays her community leadership award, flanked by Stephen Quinn (left) and John Zoltner (right) of CTCNet's DC staff. Martha Ann Moore's achievements were acknowledged by her selection for a Technology to Empower Communities (TEC) Champion Award for Outstanding Community Technology Leaders. In addition, Martha was the recipient of a 2004 Community Technology Award, presented at the 5th Annual RTPnet Conference. Eugena Harrington — it is not surprising grants came in to continue support for Gena's project. As an acknowledgement from one of Gena's school centers put it: "Gena the great: Thank you for sending Gena along. She has been brilliant! Got laptop fixed up with ethernet and modem. Has volunteered to set-up ten computers donated to our school. She is kind and tenacious… She has given hours and great kindness and support. Gena is a generous genie, and a gem of genius!" Kimmora McKinnie (2001-02): Kimmora's project was to provide technical support and training support to the Eastern Wake CTC in the Riley Hill Family Life Center. 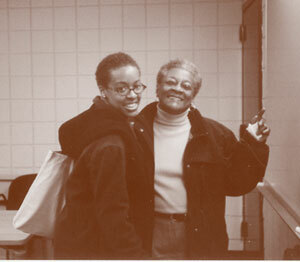 Kimmora recruited adult students (ages 19 to 82), taught introductory computer courses, and trained community volunteers to teach the courses. She initiated an after-school program, with students recruited through the East Wake Middle School guidance department, and recruited community volunteers to assist her work with the middle school students. Ella Holden (2002-04): Ella's project provided technical support and training for the Riley Hill CTC. Ella taught classes for adults and worked with youth in the after-school program, continuing and expanding the programs started by Kimmora. She also expanded community involvement in the center and developed a computer repair course. Shirlene Rogers (2001-03): Shirl's project, along with the volunteer database she developed that paved the way for Tech LinkUp, was to assist the President of the CTCNet board of directors, Erroll Reese in Durham, with program development and capacity building and included research, statistical analyses, reports, speeches, and PowerPoint presentations promoting CTCNet at several major conferences. Douglas Dumont (2002-03): Douglas' after-shool CLICK project, developed at Rogers Herr Middle School in Durham, also involved creating a template for replicating the program in North Carolina and nationwide. The curriculum, lesson plans and teaching modules, oriented toward 6th graders, were presented at the RTPnet 2003 conference and at the CTCNet 2003 conference, as part of the session CTCs & Local Schools, and are freely available. Chad Custer (2003-04): Chad's project to continue and expand CLICK, was extended to Lyon's Park Community Center where Chad designed a complementary curriculum for younger students. CLICK materials are used by organizations across the nation. 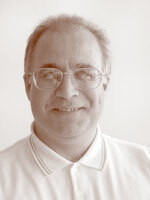 Vahid Nourani and Damita Chambers (2004-05): Their project was to monitor, coordinate, and promote Tech LinkUp and provide support for TechCoop projects. Vahid also provided extensive technology support for Triangle United Way's Teaming for Technology (T4T) as well as many local CTCs and other nonprofit organizations. Damita coordinated numerous activities and presentations for T4T and the Triangle 501 Tech Club and also coordinated the 6th Annual RTPnet Conference and Community Technology Awards. Vahid is currently serving a second year as a CTC VISTA with Durham Literacy Center, while Damita continues service as a Public Ally with Alliance of AIDS Services Carolina. For RTPnet and the North Carolina communities we serve, CTC VISTAs have made an enormous difference. Judith Huntress Hallman (http://www.rtpnet.org/hallman/) is Executive Director and President of RTPnet and has worked as a volunteer for RTPnet since 1989. Judy provided computer support services at the University of North Carolina at Chapel Hill (where she received a BA and MA in Mathematics), from 1967-1999. Her work included supervision of the Help Desk, training, documentation, and program development. When she retired (March 1, 1999), she was Campus Webmaster.